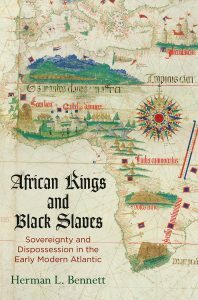 A discussion of African Kings and Black Slaves: Sovereignty and Dispossession in the Early Modern Atlantic (Penn Press: 2018). Featuring author Herman Bennett (History, Graduate Center CUNY), with discussants Christopher L. Brown (History, Columbia), Mamadou Diouf (African Studies and History, Columbia) and Sibylle Fischer (Spanish and History, NYU). As early as 1441, and well before other European countries encountered Africa, small Portuguese and Spanish trading vessels were plying the coast of West Africa, where they conducted business with African kingdoms that possessed significant territory and power. In the process, Iberians developed an understanding of Africa’s political landscape in which they recognized specific sovereigns, plotted the extent and nature of their polities, and grouped subjects according to their ruler. In African Kings and Black Slaves, Herman L. Bennett mines the historical archives of Europe and Africa to reinterpret the first century of sustained African-European interaction. These encounters were not simple economic transactions. Rather, according to Bennett, they involved clashing understandings of diplomacy, sovereignty, and politics. Bennett unearths the ways in which Africa’s kings required Iberian traders to participate in elaborate diplomatic rituals, establish treaties, and negotiate trade practices with autonomous territories. And he shows how Iberians based their interpretations of African sovereignty on medieval European political precepts grounded in Roman civil and canon law. In the eyes of Iberians, the extent to which Africa’s polities conformed to these norms played a significant role in determining who was, and who was not, a sovereign people—a judgment that shaped who could legitimately be enslaved. Through an examination of early modern African-European encounters, African Kings and Black Slaves offers a reappraisal of the dominant depiction of these exchanges as being solely mediated through the slave trade and racial difference. By asking in what manner did Europeans and Africans configure sovereignty, polities, and subject status, Bennett offers a new depiction of the diasporic identities that had implications for slaves’ experiences in the Americas.